You will enjoy the fresh breezes and the warmth of outdoors from your patio. Sit and relax on your patio and enjoy family and friends. 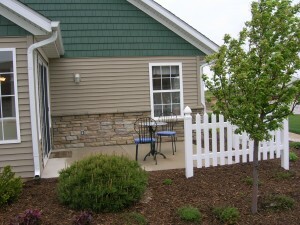 When you own a new retirement home at Somerset Farm you will have a patio and a sunroom. Stop dreaming call and reserve your home today. Somerset Farm is a 55+ retirement community located in Sycamore in a rural setting but with all of the conveniences of the city nearby.